S-9304 Micro-Bond Gray and S-9306 Micro-Bond White are made especially for micro-topping. This cementitious product contains extremely fine sands to create a smoother finish. Micro-Bond is the smart solution for repairing and resurfacing concrete interior floors, countertops, and decorative art surfaces. 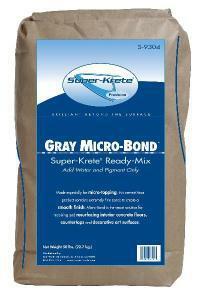 Micro-Bond is available in white and gray.